I noticed there was a big ol’ container of 38% cream in the fridge left from Christmas, and I decided that like a productive human being I should probably use that before it goes bad. 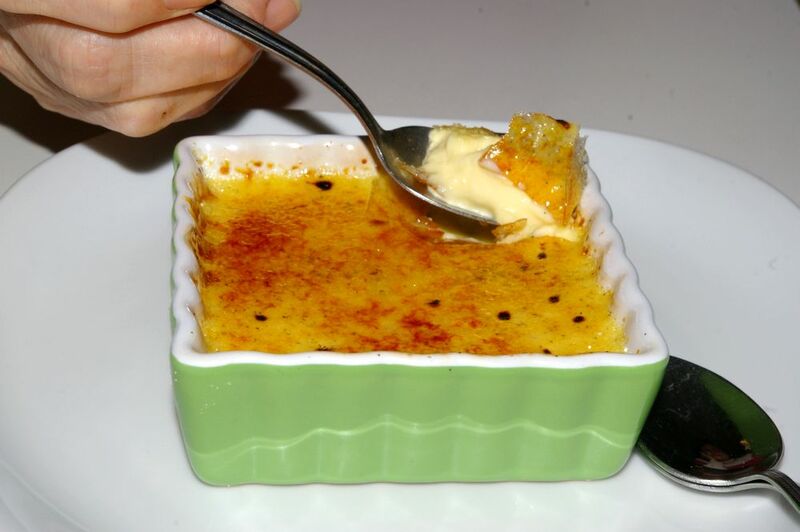 What better dessert to make with heavy cream than creme brulee? I know I know, I’m so smart. Also, I have a terrible weakness to a really good creme brulee. The creaminess and delicious vanilla flavour…other flavours are good too though. Ginger, strawberry, maple blueberry OH GOD I have an addiction! Thank god I don’t make it that often. This stuff is terrible for you. Just absolutely terrible. But it will make you happy. I promise. Behold the giant creme brulee! In my cute little retro-green square ramekins. So cute. I love. I’ll be honest, in the past when I’ve made creme brulee at home it hasn’t been up to my standards. Even using recipes that I know work out awesomely when I make them at work. It drives me crazy, so today I randomly decided to be adventurous and take the path of a new recipe. I got this one from epicurious, hurray. It turned out really really well! I am very happy with the results. My mom was, too. She never, hardly ever, eats dessert let alone an entire item of dessert. Initially I just torched up one creme brulee for us to share but my mom made me prepare one just for herself. That means I must have done something right! Yeaaahh yeahhh, uh uh, get it get it I MADE IT GOOD. That was supposed to be some sort of weird song thing I don’t really know what happened. I got a little out of control. 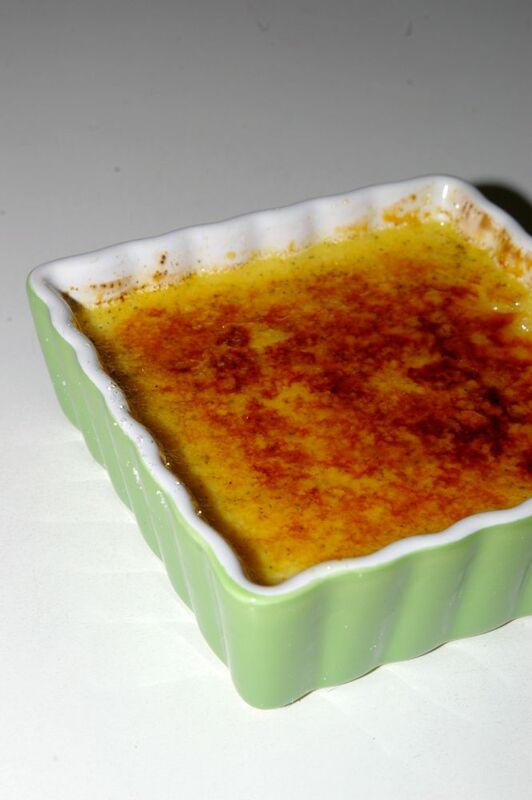 Okay, in the above picture the creme brulee looks a little bit runny but I promise you that it isn’t at all. It’s rich, and creamy, and thick, and dreamy. It will be your best friend. Your very best friend that takes you shopping and tells you that you look awesome in something that really makes you look terrible. That’s the kind of friend that creme brulee is. Not a very good one. It’s just so irresistible but you know that the relationship isn’t good for you. Sigh. Well, here’s the recipe dudes. Preheat your oven to 325F, and prepare a 9×13″ dish with the ramekins arranged inside and hot water coming up just a little over halfway to the ramekins. In a heavy bottomed sauce pan combine the cream with sugar and the vanilla beans and pod. Heat over low heat until the sugar has dissolved. Continue heating over medium until hot and you feel the vanilla has steeped long enough. In a separate bowl, whisk the egg yolks just a little bit until smooth. While whisking, slowly pour in the hot cream mixture. Then transfer this back to the pan and gently stir for just a minute or two. Strain this mixture into a big ol’ measuring cup and then divide amongst the ramekins. They shouldn’t be filled to the top, that will make your life difficult what with the water and sloshing around and whatnot. Keep them in their happy little water bath for about 30-35 minutes until just the centre jiggles a bit when you tap on the side of the ramekin. You’re looking for more of a gelatin-like jiggle rather than a liquid jiggle. Remove them from the oven and oh so carefully remove them from their happy water bath. Be careful not to knock one over and onto the floor and the dog like I did today (he was a happy puppy!). Cool those little babies for about 30 minutes then transfer them to the fridge to chill for at least 3 hours or overnight. To caramelize the top, sprinkle a thin even layer over the top and use a blowtorch to melt and caramelize the sugar. Or if you don’t have a blowtorch you can use the broiler method which I have never tried so I don’t really know how that works. I would assume just sugar all the tops, then pop them under broiler in a pan keeping a close eye on them and taking them out once they turn deliciously golden brown. Done! This entry was posted in Delicious things I think are pretty delicious and tagged caramel, creamy desserts, creme brulee, ohmygodit'sgood, vanilla bean, vanilla bean creme brulee. Bookmark the permalink.